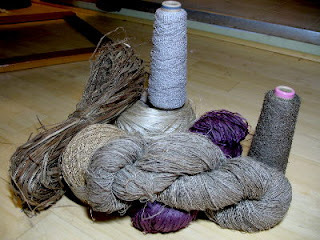 Doing a project for an upcoming Shannon book with a bunch of yarn from Habu - hemp, nettle, linen, paper. 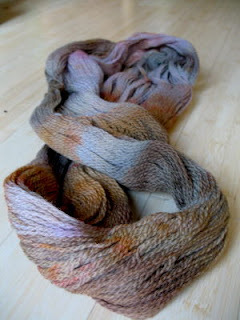 Some amazing gorgeous gifty hand-dyed yarn from Shannon. Shades of dirt with a purple cast over the whole thing. Don't know what I'll make, maybe socks. I'm freezing this winter already. 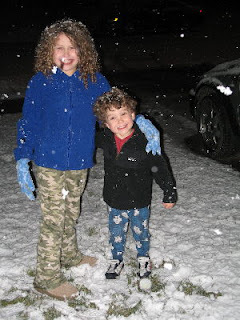 First snow (it was in November). Yes, Henry is wearing pajamas & I am mother of the year. well he is wearing shoes and a coat... i think you've fulfilled your motherly duties there! Yeah, I do too. I finally had to tie my son down to make him wear a winter coat in 10F weather!! Exactly. So long as shoes are involved, you're all good.